Posted on August 31st, 2017 in Surf Reports. Posted on August 31st, 2017 in Dee Why. At 0600 the MHL buoy was detecting 3.76m of 10-sec SSE swell and as you can see from the pics, wave faces were probably into that range along the beach and not far off it at the point. Plus, the Bureau is telling us to expect it to peak around midday. So, those bomb sets aren’t likely to back off anytime soon. Apart from the challenge of the size and raw look to the swell, we can expect the wind to go southerly soon and be 20-30 kts. However if you were in the water by 0700 when I grabbed the pictures, wind was still offshore at around 10 kts. Tide hits low at 0910 and then will be back to a moderate 1.4m high at 1555. Weather should be sunny with a high of 17 for the last day of winter. The Goat should roll out a forecast later today, so I’ll just observe that from my reading of the models, it looks like waves through the weekend. A high pressure system near Tasmania extends a ridge into New South Wales, while a low is deepening over the Tasman Sea. Together, these systems are generating fresh to strong southerly winds over coastal waters, and an increasing swell. Winds will gradually ease tonight and Friday as the low loses influence and the high drifts east. Winds are forecast to turn northerly on Saturday ahead of the next front, expected to cross the state on Sunday. Southerly 2 to 3 metres inshore, increasing to 3 to 4 metres offshore around midday. Southerly 15 to 25 knots decreasing to 10 to 15 knots in the evening. Partly cloudy. 20% chance of a shower in the morning. Variable about 10 knots becoming northeasterly 10 to 15 knots during the day then tending northerly during the evening. Large and powerful surf conditions in the early morning are expected to be hazardous for coastal activities such as crossing bars by boat and rock fishing. Posted on August 30th, 2017 in Dee Why. As of 0600 the MHL buoy was detecting 1.7 metres of 14 sec SSE swell out at sea. Along Dee Why beach that was translating into the odd waist high bump for the patient and well-positioned people in the water. Tide hits low at 0805 and will then run into a 1.4 m high at 1450. Weather should be partly cloudy and a mild 19 ahead of a late S-SE change this afternoon. Have yourself a top old day and go well with your plans! A slow-moving low over the Tasman Sea continues to direct southerly winds along the New South Wales coast whilst a high south of the Bight extends a ridge to southeast Australia. A cold front will move along the New South Wales coast today bringing a strengthening southerly airstream. The high is expected to move over Tasmania in the wake of the front with a ridge of high pressure extending northwards across the state. Another low will develop over the Tasman Sea and as it moves towards New Zealand the ridge will move over the east of the state before a high centre develops over the northern Tasman Sea on the weekend. Variable about 10 knots becoming southerly 15 to 25 knots in the middle of the day. Winds reaching up to 30 knots in the evening. Below 1 metre, increasing to around 1 metre during the afternoon, then increasing to 1.5 to 2.5 metres by early evening. Southerly around 1 metre, increasing to 2 to 2.5 metres later in the evening. South to southwesterly 25 to 30 knots. Southerly 2 to 3 metres inshore, increasing to 3 to 4 metres offshore. South to southwesterly 15 to 25 knots decreasing to about 10 knots during the evening. 1.5 to 2.5 metres, decreasing below 1 metre during the evening. Posted on August 29th, 2017 in Dee Why. Swell at Dee Why point was solidly overhead on the sets at 0630, but the Bureau says it should fade noticeably by around midday. But it shouldn’t go flat. The call is for southerly wind later but it was offshore at 0630 when I checked the ocean for the first time. Low tide was at 0710 and will be back to a 1.4 metre high at 1350. By then the south wind should be a factor, although on the hopeful side, the forecast does say it’ll be fading to light and variable as we head to a 18 high under partly cloudy skies. Tomorrow should be sunny and small but not not flat with light offshores all morning. The Bureau and the models show another southerly event with both wind and swell kicking up again into the solid range at south magnets for Thursday. This morning’s model consensus suggests we can expect south swell in the waist to shoulder plus range right through the weekend. Get amongst it if you can and have a great Tuesday! A slow-moving low over the Tasman Sea continues to direct southerly winds along the New South Wales coast whilst a high south of the Bight extends a ridge to southeast Australia. Winds along the coast should continue to ease today. A cold front over the Southern Ocean should reach Tasmania tonight and then move along the New South Wales coast on Wednesday bringing another fresh southerly airstream. The high is expected to move over Tasmania in the wake of the front with a ridge of high pressure extending northwards across the state. Another low will develop over the Tasman Sea and as it moves towards New Zealand the ridge will move over the east of the state before a high centre develops over the northern Tasman Sea on the weekend. Southerly 10 to 15 knots becoming variable about 10 knots in the late afternoon. Southerly 1.5 to 2.5 metres, decreasing to 1 to 1.5 metres around midday. Variable about 10 knots becoming southerly 15 to 20 knots in the middle of the day. Southerly around 1 metre, increasing to 1.5 metres later in the evening. Partly cloudy. 70% chance of showers offshore, 40% chance elsewhere. Posted on August 28th, 2017 in At large. Swell going past the Bower for the most part – but there were exceptions. Posted on August 28th, 2017 in Dee Why. 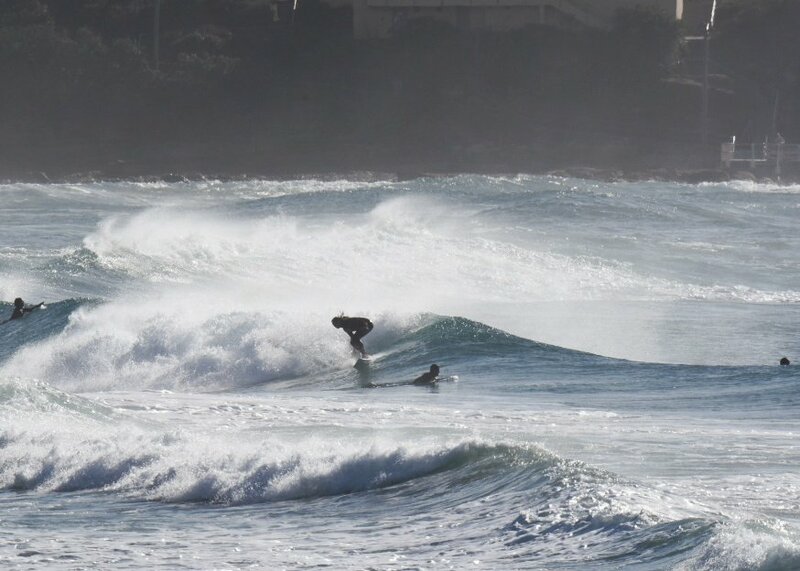 Not really surfable looing at Dee Why this morning. Swell was close to the 5 metre mark at 0500. It was straight south and around 10 seconds apart. No one was in the water for obvious reasons, so I’m only guessing that sets are around 1.5-2x overhead on the bombs. It could be bigger. Wind at North Head was coming from the WSW at 15-20 kts when I wrote this at 0730. The wind is expected to decrease as we get toward dark. Looking at the cams, I’d say your best hope of a wave will be at the usual suspects for these conditions, namely the south end of Manly and Collaroy to Fishermans. Tide was low at 0625 and will be back to a 1.4 m high at 1300. Tomorrow looks a little more plausible for a surf along the Dee Why to Longy stretch. The wind should have backed off a bit and the swell will be dropping. Right now it seems that the energy will fade into Wednesday and then overnight it will start to come up again and be back around the 3 metre mark from Thursday through Friday. A vigorous south to southwesterly change move north along the coast overnight. Winds and seas will gradually ease later on Monday and during Tuesday as a high pressure system, currently south of the Bight, moves east and extends a ridge to the western Tasman Sea. The next southerly change is expected on Wednesday. South to southwesterly 25 to 30 knots, reaching up to 35 knots offshore early in the morning. Winds decreasing to 15 to 20 knots in the evening. 2 to 3 metres, increasing to 2.5 to 4 metres offshore. Partly cloudy. 80% chance of showers offshore, 50% chance elsewhere. Southerly 15 to 20 knots becoming variable about 10 knots in the middle of the day. Variable about 10 knots becoming southerly 10 to 15 knots during the morning then increasing to 15 to 20 knots during the afternoon. Below 1 metre, increasing to 1 to 1.5 metres during the evening. Posted on August 27th, 2017 in Dee Why. Sunday started off mild, sunny and with light winds. Swell has dropped overnight and the MHL buoy is now showing about a metre from the SSE at 10 seconds apart. There were a couple of folks in the water at the point and more scattered along the beach. From what I could tell it seemed to be in the knee to waist high range but with quite long waits for anything to turn up. Yesterday it seemed to be 30% bigger at Curly, so that might be worth a look if you don’t mind the Sunday crowds. Tide was low at 0545 and is now headed to a 1.45m high at 1215. Despite the sunny and mild start to the day, the Bureau tells us it’ll all go pear-shaped later when a vigorous SW-S change and showery skies arrive. There’s even a chance of hail. We’re in for a wild couple of days with rain, lots of SW wind going southerly in the afternoon and swell ramping up into the 2-3 m range on Monday. Tuesday may possibly be a little more friendly to surfing as the swell fades back a touch and Huey starts to turn down the wind machine. The good news is that the end of the work week currently looks rather hopeful on the models, with some calling for 2-3 metres of south swell and SSW wind. A vigorous southerly change associated with a cold front will develop along the New South Wales south coast during Sunday morning extending to Sydney Waters in the afternoon and reaching the Queensland border overnight. Winds and seas will gradually ease later on Monday and during Tuesday as a high south of the Bight extends a ridge to the western Tasman Sea. Next southerly change is expected to develop on Wednesday. West to southwesterly 20 to 30 knots decreasing to 15 to 25 knots in the morning then becoming southwesterly 25 to 30 knots in the late afternoon. Winds reaching up to 35 knots offshore in the late evening. Southerly around 1 metre, increasing to 2 to 3 metres by early evening. Partly cloudy. 90% chance of showers during this afternoon and evening, with possible hail. Southwesterly 25 to 30 knots, reaching up to 35 knots offshore early in the morning. Winds turning southerly 20 to 30 knots in the late afternoon. Partly cloudy. 80% chance of showers offshore, 40% chance elsewhere. Southerly 15 to 20 knots becoming variable about 10 knots during the day. Posted on August 26th, 2017 in At large. Southerly winds along the New South Wales will tend west to northwesterly in the south later today ahead of a strong southerly surge associated with a cold front during Sunday. Behind the front a high pressure system will move over southeastern Australia on Sunday extending a ridge to the western Tasman Sea and winds should ease. Southerly 10 to 15 knots tending southwesterly in the morning then becoming variable about 10 knots in the early afternoon. North to northwesterly 10 to 15 knots shifting southerly 20 to 25 knots in the middle of the day. Winds reaching up to 30 knots during the afternoon and evening. Below 1 metre, increasing to 1 to 2 metres during the morning, then increasing to 2.5 to 3 metres by early evening. Partly cloudy. 50% chance of showers offshore, 30% chance elsewhere. Southerly 15 to 25 knots turning southeasterly 10 to 15 knots during the evening. Posted on August 25th, 2017 in Dee Why. Chilly start with grey skies and 10-15 kts of WSW wind this morning. A few bods at the point where the swell’s not quite doing it. Sets there looked to be in the waist to maybe chest and a bit range. Up the beach it was relatively smooth and a bit bigger. Not fantastic quality and the tide is coming into a 1.5m high at 1045. The day’s not expected to warm up much either. Our high is going to be around the 17 mark. 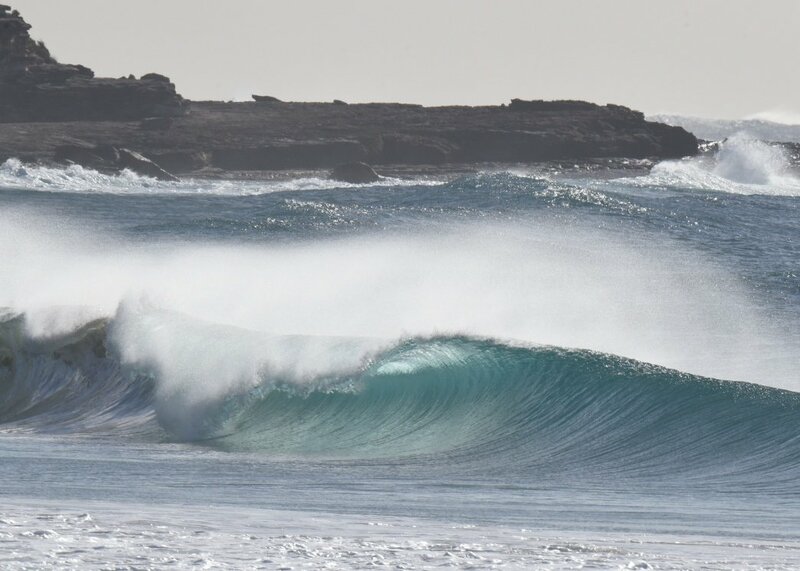 The Bureau says the wind will be southerly through the day and the swell should come up a bit more. The MHL buoy was offline when I checked, but I’d say the Bureau’s prediction of 1.5-2 metres from the south looks consistent with what was showing at Dee Why. 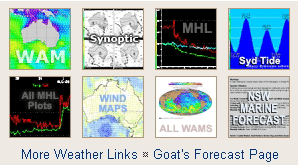 As for the outlook, well, we have a freshly baked set of prognostications from the Goat. Stay warm, and good luck if you decide to get wet! A weak low pressure system over the Tasman Sea and a ridge of high pressure extending over the state from the west are combining to establish southerly winds across the waters into the new week. Southerly 15 to 25 knots, reaching up to 30 knots offshore during the morning. Winds decreasing to 10 to 15 knots in the late evening. 1.5 to 2.5 metres, decreasing to 1.5 metres later in the evening. Partly cloudy. 70% chance of showers offshore, 40% chance elsewhere. The chance of a thunderstorm offshore this morning. Southwesterly 10 to 15 knots turning southerly 15 to 25 knots during the afternoon. Southerly around 1 metre, increasing to 2 to 3 metres during the afternoon or evening. Becoming cloudy. 60% chance of showers. Posted on August 24th, 2017 in Goat's Forecast. Thursday: 1-2 metre range South East. Water temp is 17-18 which is cool in my book, and I don’t mean Cool. Partly cloudy. High (70%) chance of showers developing in the afternoon along the coastal fringe, medium (50%) chance elsewhere. Winds southerly 25 to 40 km/h turning southwesterly 15 to 25 km/h in the evening. Partly cloudy. Medium (40%) chance of showers along the coastal fringe, slight (20%) chance elsewhere. Winds southwesterly 25 to 35 km/h tending southerly in the morning then becoming light in the late evening. Mostly sunny. Areas of morning frost in the outer west. Slight (20%) chance of a shower along the coastal fringe, near zero chance elsewhere. Light winds becoming east to southeasterly 15 to 20 km/h during the day then becoming light during the afternoon. Cloudy. High (70%) chance of showers. Light winds becoming south to southeasterly 15 to 25 km/h during the day then tending south to southwesterly 15 to 20 km/h during the evening. Partly cloudy. High (70%) chance of showers. Winds southwesterly 15 to 20 km/h turning south to southeasterly during the day. Partly cloudy. Medium (60%) chance of showers, most likely later in the day. Light winds becoming southeast to southwesterly 15 to 20 km/h during the day.